You can find Altea Hotels through the local tourist information at the Calle de Sant Pere 9 along the harbor area. Finding nice Altea hotels should not be a problem, at least not off season. However, if you are looking for real luxury and comfort during your stay in Altea, we will recommend the following two hotels. For both hotels we received excellent feedback from our readers and therefore can forward both Melia hotels and resorts to you. The Melia Villa Gadea Hotel in Altea is an amazing hotel which has everything you could possibly wish for, including a garden restaurant. It’s also located right next to the beach, and within easy reach of all the tourist attractions. 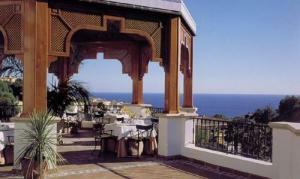 Read more about this lovely Altea hotel here.. The Melia Altea Hills Resort is designed in a typical Mediterranean way, and has fantastic views of the sea. It’s located in a great place so it’s easy to get wherever you want to go! Find our short review about this resort in Altea here. A list with further 2 , 3 , 4 and 5 star hotels in and around Altea can be found here. Take in mind the big demand especially in the summer months for Altea Hotels, check availability and do your booking early at your travel agency or via the web. A quick guide on the hotels rating system in Spain. Concerning the star-rating of hotels you should be fine with one of the 3-star altea hotels for basic accommodation. The 4 and 5-star hotels will most of the time offer additional services, such as restaurants, swimming pool etc. depending on the hotel. Again please check pricing and availability of altea Hotels early when you plan a vacation in summer and also look for Altea apartments at Altea real estate companies which can be a cheaper alternative, specially outside the summer months. So far I will not start to recommend any special Altea hotels because expectations and perceptions are so different. In general check that the hotel offers a swimming pool, which most do as it is a welcome alternative and decent breakfast buffet. Some Altea hotels offer all-inclusive packages which might be bargain. However restaurants and pubs are a perfect alternative to any kind of package tourism. ...share your opinion and write a review about your favourite Altea hotel! I am really sure, our readers whould love to hear about why you liked it so much. It is really easy to do. Just click here and write your story about your favourite hotel in Altea?